Have you ever wondered if you could resell your blog posts and make some extra cash? You know, get the posts you’ve written for your personal blog republished somewhere else. If so, my blog editor Evan Jensen and I have a cautionary tale for you. Many bloggers seem to believe publishing a post on their own blog — or even on a free platform such as LinkedIn Pulse or Medium — doesn’t ‘count’ as publication. And that they could still get paid selling first publication rights to these posts. Sometimes, writers don’t even feel they need to disclose the work was previously published. This can result in an awkward mess, when the blog or publication you resold your work to figures out they’ve gotten recycled goods. I know, because this blog recently and inadvertently accepted previously published content. As the queen says, we were not amused. Here’s the story of what happened, and how we’re changing our guest-posting policy as a result. 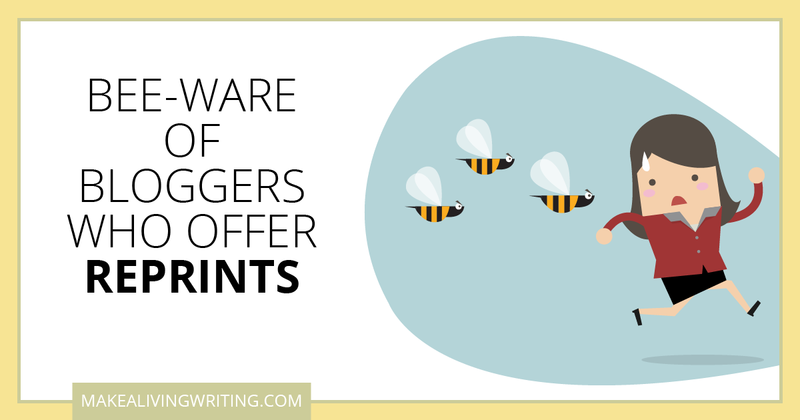 We’ve also got some important tips for bloggers considering trying to sell reprints. Longtime MALW readers may know that in general, I’ve had a pretty laid-back attitude about my articles getting ripped off online. Until last week.